Newport Beach was incorporated as a city in 1906, but it’s not the first town in the state to adopt that moniker. 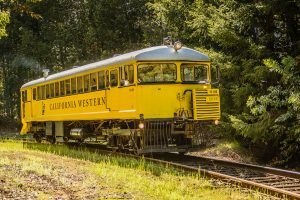 In Northern California, the town of Newport was established in Mendocino County around 1865 as a port to transfer lumber into waiting schooners for the journey to San Francisco. A small town sprang up and flourished, but after a better port was established at Fort Bragg, the town of Newport eventually disappeared. 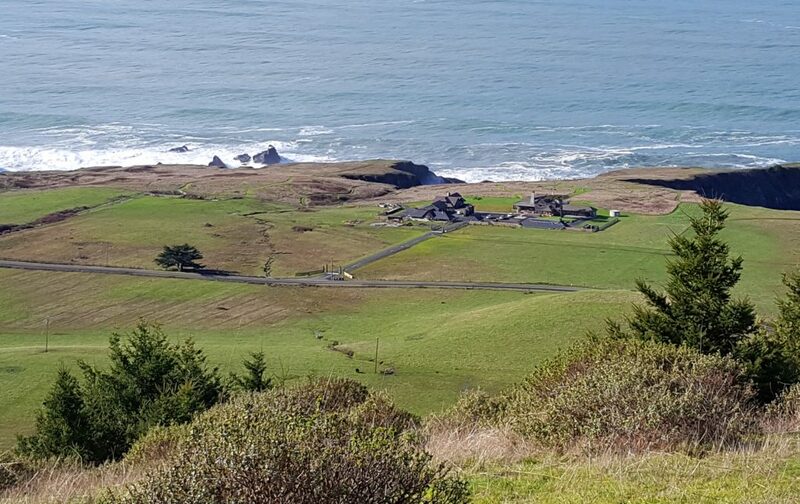 Now, Newport is back thanks to Will Jackson and his family, who purchased a 2,000 acre coastal cattle ranch where the town of Newport once stood. Jackson built a home on the property, and then – with the desire to share the beauty of his ranch with others – built what is now The Inn at Newport Ranch, a private retreat for vacations, weddings, and other events. We learned about The Inn at Newport Ranch last year, and after perusing the Inn’s website and doing some research on Mendocino County, we excitedly took the offer to spend a couple of days in January at the Inn at Newport Ranch. “Llamas? I’ve never heard of that in NorCal,” replied Catherine. 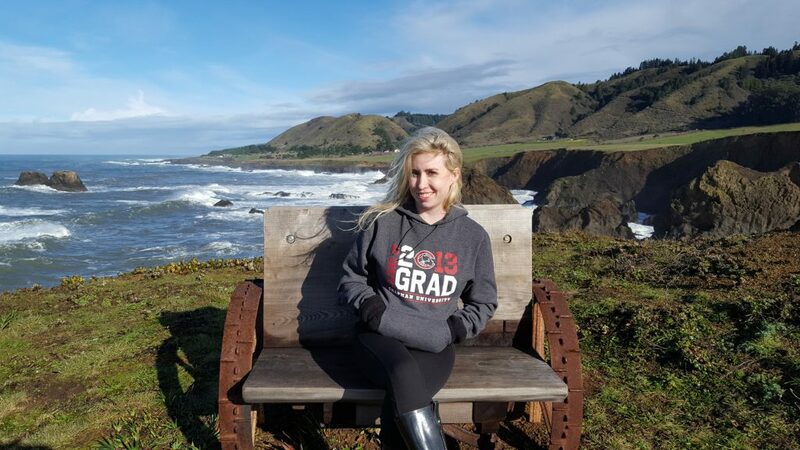 Most of our getaway trips are via car or train, but since The Inn at Newport Ranch is about a three-hour drive from the bay area, we opted to fly to Oakland, rent a car, and drive through Sonoma County to do some wine tasting en route to the coast. We booked a 10 a.m. flight on JetBlue Airways out of Long Beach and arrived at the airport early enough to grab breakfast in the terminal (if you call burgers and fries breakfast). Catherine challenged Christopher, who tends to travel with multiple bags, to just bring a carry on (plus laptop) on the flight. Although the weather in January was unstable and the forecast suggested rain, we managed to bring what we needed without checking bags. After landing and taking a shuttle to the Dollar car rental counter, we drove off at noon in an SUV for our NorCal adventure. 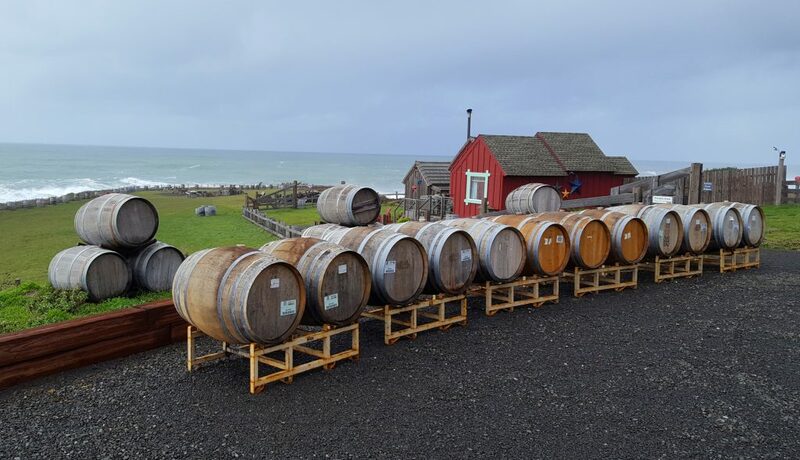 We headed north on Highway 101 and plotted a course for Lula Cellars, where we were scheduled to meet with winemaker Jeff Hansen at 3:30. We made a pit stop at J Winery, known for sparkling wines and Pinot Noirs. A dozen pinots were listed on the wine menu, and half a dozen sparkling. The flight tasting is $20 for five wines. We sampled whites, pinots, and a nice brut rose, then hit the road again. We turned onto Highway 128 towards the coast. The 128 is akin to Highway 29 in Napa Valley, but not as touristy. 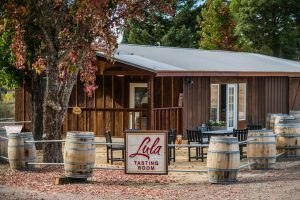 Numerous noted wineries beckoned along the 128, but we were on a mission—a Lula mission. As we drove, the temperature started to drop, and it began to rain. The temperature continued to drop, and it started to snow! Fortunately, it was a slushy snow that didn’t linger long and soon turned back into rain. We made it to Lula Cellars later than expected, and learned that Hansen was also battling the elements and unable to make it to the winery. 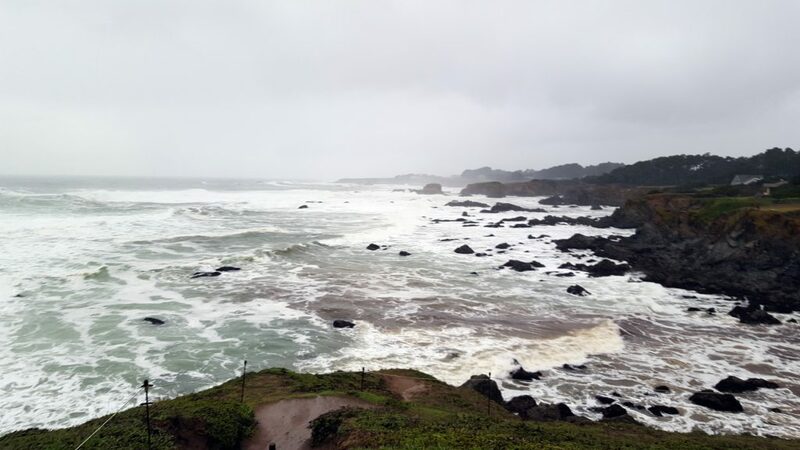 Apparently the Navarro River, which runs along Highway 128, had washed out the road just past Lula Cellars, making it impassable between Lula and Highway 1. We mulled over our options while enjoying the hospitality of the friendly Lula Cellars staff, especially tasting room manager Dan Reed, who took great care of us. 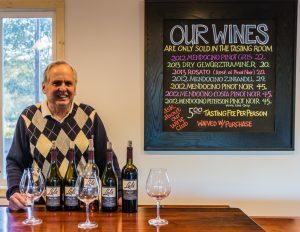 He explained the wines, and the concept behind Lula Cellars, a small production, ultra-premium winery located in what is dubbed the “Deep End” of Mendocino County’s famed Anderson Valley. 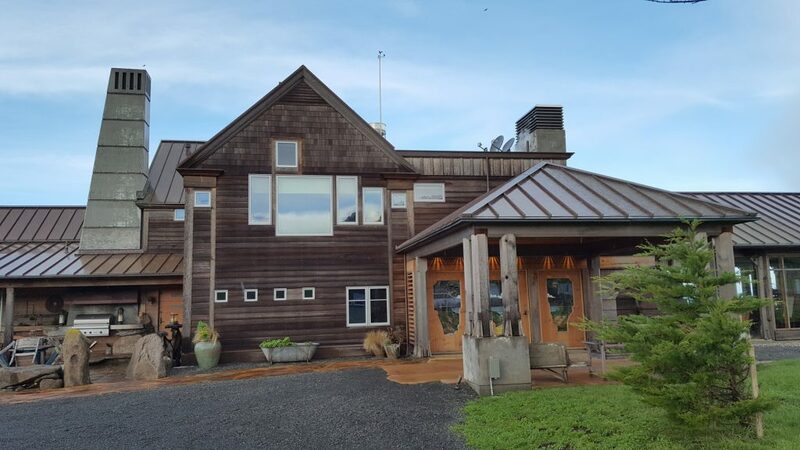 Named for Hansen’s grandmother Lula, the winery produces Pinot Noir, Zinfandel, Dry Gewurztraminer, Rosato and Sauvignon Blanc wines, made entirely with grapes grown in vineyards from Mendocino County. Lula makes around 3,000 cases of wine each year. 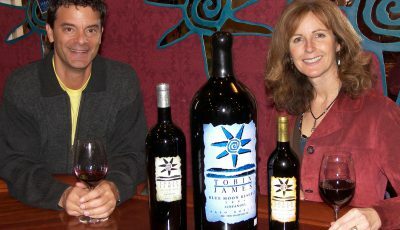 Most are sold through the tasting room and to their growing wine club members. 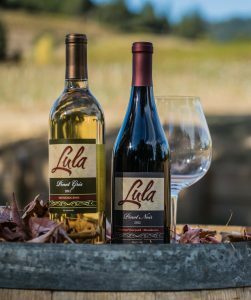 Lula Cellars has racked up numerous wine competition awards. After tasting the wines, we knew why they garnered accolades. The Pinots were not only well made, they each had distinct characteristics that set them apart from each other. We also enjoyed the Zinfandel, and the Rosato—a lovely rose with hints of cherry and strawberry. The Lula staff phoned the Inn at Newport Ranch to let them know we’d be late, and the Little River Inn, where we were booked for dinner. The Lula staff provided a detour route that could get us to the coast—albeit north of our dinner destination. After leaving with several bottles of Lula pinot noir, we navigated to the detour. By now it was raining steadily, so with our unfamiliar backroad detour, we made it to Little River Inn just as they were closing. Having skimmed the menu online, we had been looking forward to trying some of their classic dishes such as pine nut crusted salmon, confit pork osso bucco, steak Diane, sole almondine, and even the fish and chips. 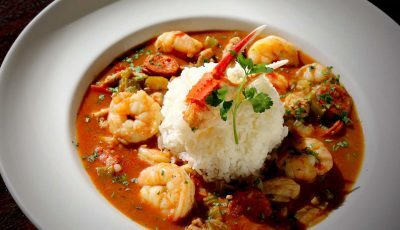 We vowed to make another trip north soon and add Little River Inn to our itinerary. We headed north on Highway 1 to Ft. Bragg, where we found an open pizza parlor (Catherine’s go-to food group) and grabbed a bite to eat before finally making our way to The Inn at Newport Ranch. We checked in and were shown to our rooms. Christopher was in the Captain’s Quarters with spectacular views of the ocean, Catherine in the Chute room next door. There was one other couple staying at the Inn that night and they happened to be downstairs in the spacious living room, so we joined them for wine and conversation until it was time for bed. We awoke to a chilly and drizzly morning, but the cozy warmth of The Inn was the perfect antidote for the weather. We enjoyed a hearty made-to-order breakfast and, seeing the rain had stopped, took a short walk to the cliffs above the ocean. 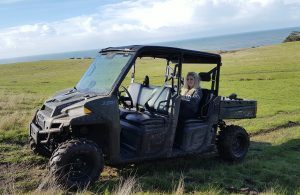 We had an ATV tour of the property scheduled for 10 a.m., which turned out to be the perfect method of getting a sense of the scope of the property, which ranges from dramatic coastal vistas to fields of grass and cattle (no llamas) to thick forests. Our ATV guide filled us in on the history of the property, and pointed out scenic and historic spots along the way. We occasionally got out of the ATV to snap photos of the cliffs and coastline. 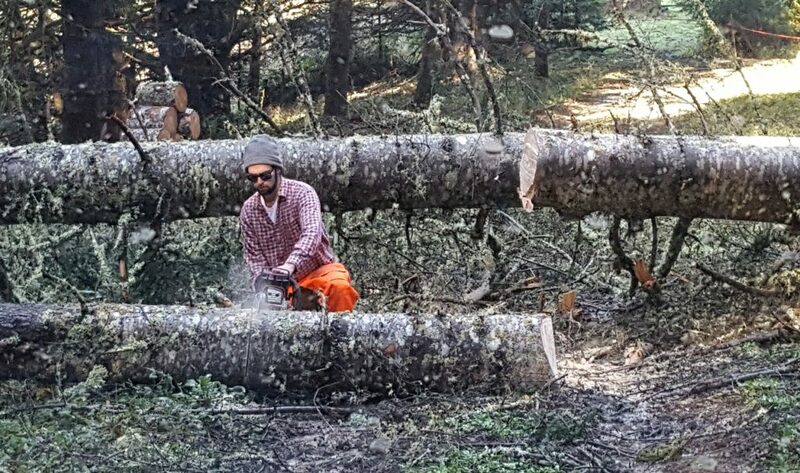 As we drove, we encountered downed trees over the dirt road, but our driver carried a chain saw in the ATV (we learned most residents in the area do the same thing), and soon a path was cut through the tree. After returning to The Inn and a quick lunch of left-over pizza, we headed next door to Pacific Star Winery, the only winery in the state perched on a cliff a few hundred feet from the ocean. More than a dozen wines are listed on their wine list. A $5 tasting fee gets you six tastes. The wines are all reasonably priced, and very tasty. We learned that the wine is made in a combination of French, Hungarian and American oak barrels. An unusual note: waves crash into sea caves under the cellar, naturally filtering wine from its sediment. 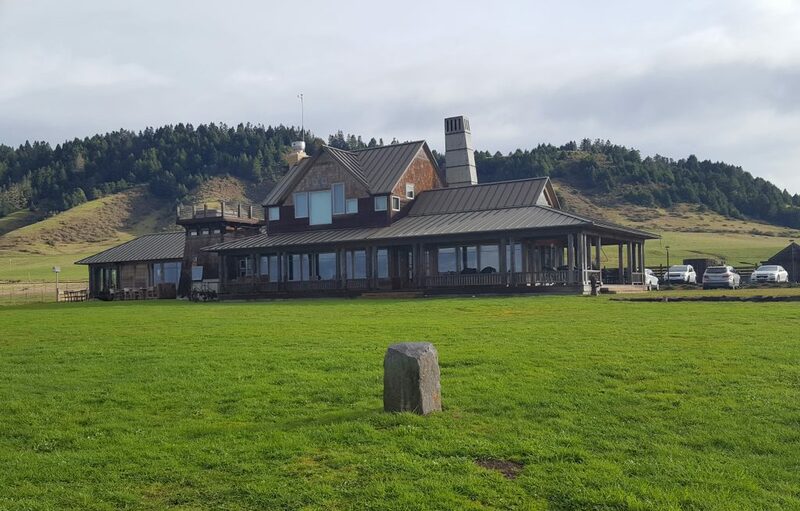 Even more unusual: the winery is situated atop the Pacific Star fault, hence the winery’s name. We ended up buying two bottles of wines, and a large shipping box to hold all the wine we had accumulated. 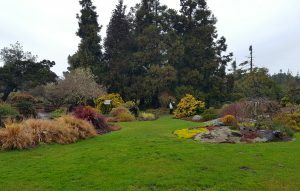 With several hours to go before our dinner at The Inn at Newport Ranch, we opted to drive to Ft. Bragg and visit the Mendocino Coast Botanical Gardens. By now it had started to rain again. Catherine forgot her umbrella and we were going to share the one Christopher brought, but the Gardens offers visitors large umbrellas to use while strolling the 47 acres of gardens that start at Highway 1 and go all the way to the sea. 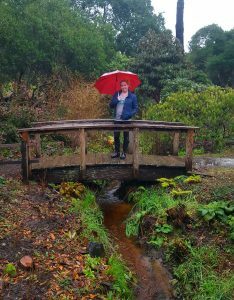 Even in the rain, the Botanical Gardens were lovely. We encountered other nature lovers as we strolled the grounds—just some of the 75,000 visitors who come to Mendocino Coast Botanical Gardens every year (Sunset magazine ranked them number two in their list of top public gardens in the western U.S.). We walked to the ocean and gazed down at the angry sea, carefully stepped among the prized rhododendrons and other plant species, and marveled at the sculptures placed throughout the gardens. We made it back to The Inn in time to freshen up and partake in the appetizer and libation hour. To our delight, owner Will Jackson – having flown in that day with family and friends for a week-long stay – joined us for a glass of wine. He told us stories behind each element of the property, from the Inn itself to the artwork. It made us appreciate the stunning architecture and authentic décor even more. Then it was time for dinner: filet mignon, fresh veggies picked from the Inn’s garden, and potatoes. And of course, wine. After dinner, we adjourned to the Newport Room, where a fire was roaring. The room has large boulders built into the walls, along with artifacts from a bygone era. We chatted with Will and his guests for a while, then retired for the night. After another fabulous breakfast, we reluctantly said farewell to The Inn at Newport Ranch. We had a 6 p.m. flight back to Long Beach, giving us enough time for more sightseeing. We were forced to take another detour to get back to Highway 128 heading east. We made a stop at Scharffenberger Cellars, which specializes in sparkling wines (the $3 tasting fee is a bargain). We bought a bottle of cremant, then continued on to Highway 101. Catherine, who was raised in Napa Valley and went to school in Sonoma, insisted we stop for lunch at Mary’s Pizza Shack, one of her favorite local culinary haunts. Full and refreshed, we had plenty of time to make it back to the airport—or so we thought. Unexpected traffic, combined with a GPS that took us on a harrowing route to the airport, meant we arrived with minutes to spare. We checked the box of wine at the JetBlue counter and sprinted to our gate, just barely making it into the plane before they shut the doors. It had been a fun and eventful three days, but we wished we had more time to spend relaxing at The Inn and exploring the Mendocino coast. We agreed to return to Sonoma, Mendocino and The Inn at Newport as soon as possible. Hopefully next time, Christopher will finally see his illusive llamas. Catherine: “The Inn at Newport Ranch is the perfect getaway for a relaxing and secluded vacation. You enjoy a sense of privacy from the world as you walk along the cliffs overlooking the ocean or hike through the large redwoods. You also have the option of touring the property in an ATV or riding horses. After a day of exploring, you can settle in for the evening with hors d’oeuvres and wine followed by a three-course meal cooked for you by the staff if you so choose. Before bed you can mingle with other guests (if there are any) or enjoy the hot tub overlooking the ocean. The rooms themselves feature elements of nature with large redwood slabs for headboards, and you will find great bath products and a cozy robe as well. 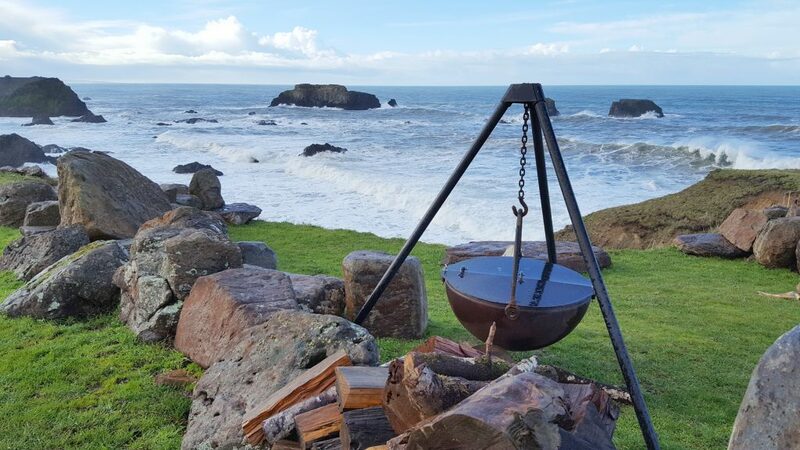 Although you may feel like you are in your own personal part of the world, the historic towns of Ft. Bragg and Mendocino are a few miles down the road and worth exploring. 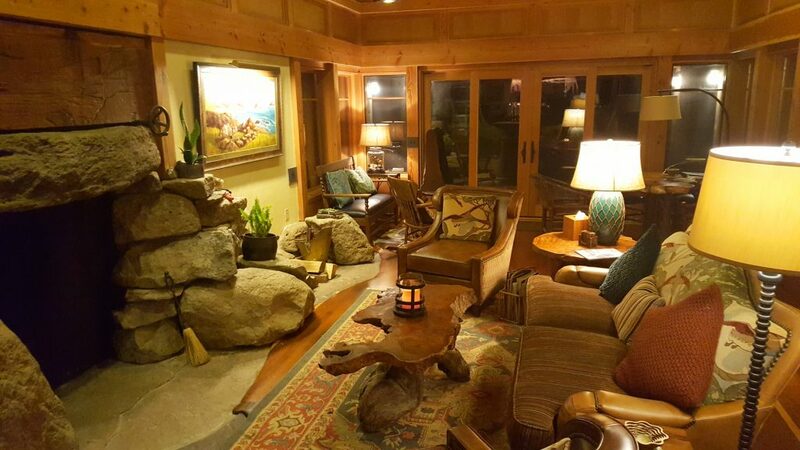 We had the pleasure of meeting the owner who told us the story behind each carefully thought-out piece of the ranch, so while you are there be sure to take in your surroundings and maybe ask the staff a question or two. 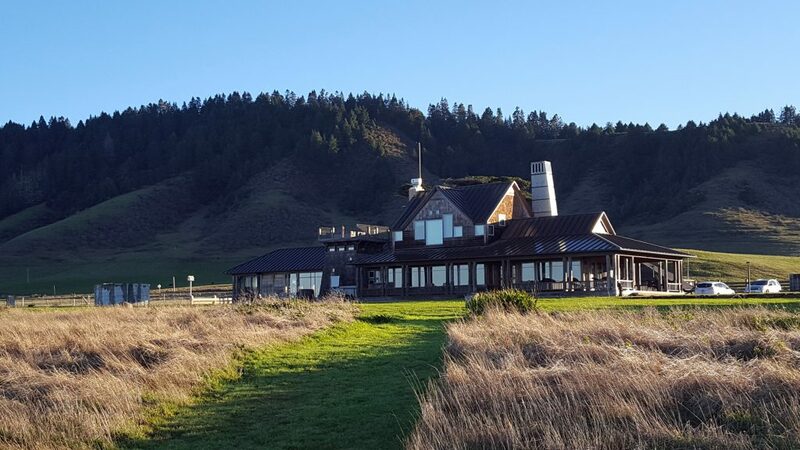 The owners and the people who work at The Ranch at Newport Inn really love the community they live in and have great advice to share for activities. They made us feel right at home with any questions we had and enhanced the experience. Christopher: “I can’t say enough good things about The Inn at Newport Ranch. Everyone went out of their way to make sure we were well taken care of. My room was comfortable and filled with artifacts that added to the ambiance, and the experience. 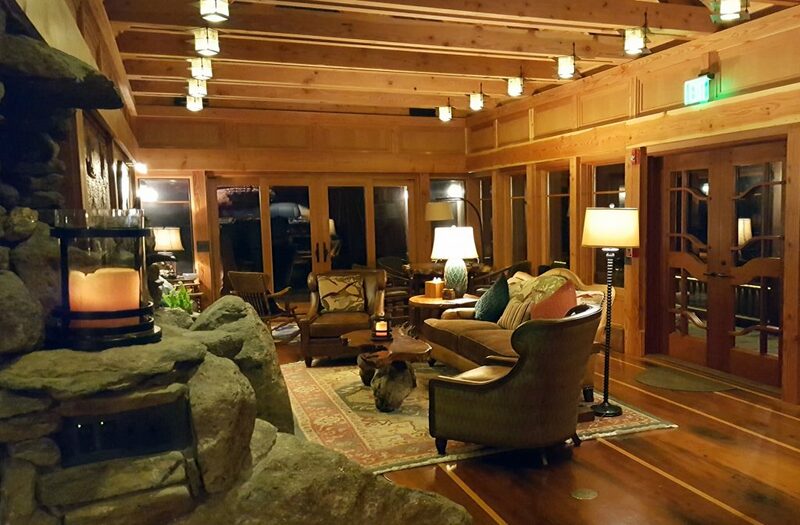 I explored much of the property and just enjoyed spending time relaxing in the great room or standing on the cliffs overlooking the ocean. The ATV tour was the perfect way to get a feel for the sprawling property. It wasn’t until we were about 500 feet above the ranch looking down from forest trail that I really had a sense of how magnificent The Inn at Newport Ranch property truly is. 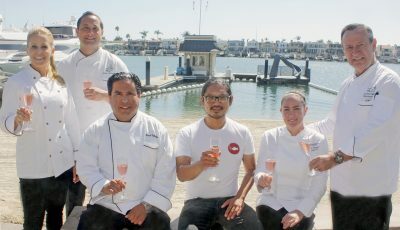 The Inn at Newport Ranch: TheInnAtNewportRanch.com. Mendocino Coast Botanical Gardens: GardenByTheSea.org. NOTE: All photos by Christopher Trela unless otherwise noted.